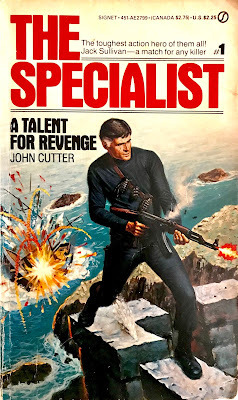 Along with writing for rock act Blue Oyster Cult and sci-fi/horror genres, John Shirley kept fairly busy in the 80s authoring a number of men's action adventure works. As D.B. Drumm, Shirley wrote a majority of post-apocalyptic books in the 'Traveler' series. As John Cutter, Shirley wrote an 11-volume series entitled 'The Specialist' for Signet. The series debut, “A Talent for Revenge”, was released in 1984. The central theme of the series is “toughest action hero of them all” Jack Sullivan's quest to find his wife's murderer(s). Along the way there's plenty of high-stakes adventure and assignments to pad the series. While there isn't a lot of detail in the debut, we do learn that Sullivan is a Vietnam veteran. We also come to the realization that he was involved in the C.I.A. and fought the Soviet Union in Afghanistan. Born in Missouri, Sullivan was raised to do the right thing and help others. His father routinely advised him that “the world is kept from falling apart only by people who help other people without being told to”. Now, in the present day, Sullivan is a mercenary fulfilling the needs of those seeking revenge. The adage of pretending to do it for the money helps rebuke those looking to take advantage. His assistant is a former C.I.A. operative named Malta, who's more of a supplier than a fighter. “A Talent for Revenge” has Sullivan accepting a job from Julia Penn. Her sister was killed by a terrorist named Ottoowa, a former African madman who now resides off the coast of France. Penn wants Sullivan to break into Ottoowa's sea-side fortress, decapitate him and bring the head to her on a platter. Seriously. John Shirley seemingly always looks to jump the shark. Built into the narrative is a diverse cast of characters ranging from former allies turned criminal, aspiring madmen, a young beauty/love interest fodder and the cops – the cops who really just stand in the way of justice when it comes to this specific genre. At 186-pages, and smaller fonts, Shirley pads the novel to a rather unnecessary length. Considering the font size, this should have briskly passed the time at 160ish pages. Often, I felt the climax was above the glass ceiling. I knew the fortress invasion was inevitable, but counted pages until the boots hit the sand. Shirley kept things interesting with plenty of firefights and a tongue in cheek presentation that lightens the mood. Sullivan toys with the bad guys, ridiculing them into killing each other or accepting his challenge despite inexperience. It's these elements that kept me in the fight to the finish. “A Talent for Revenge” is entertaining and adds a little bit of humor to what is ordinarily just another good guy with a gun prose. There's a contribution to the bigger mystery here, a compelling puzzle piece that may lead Sullivan to his wife's killer. The second book was already written upon this book's release. That allows the reader a sneak peek of “Manhattan Revenge” in the closing pages. Overall, a solid story that left me wanting a sequel. Note - A 1994 film entitled "The Specialist" is based on this series. The movie starred Sylvester Stallone as "specialist" Ray Quick. I can't find anything from that film's plot that mirrors events from this book.